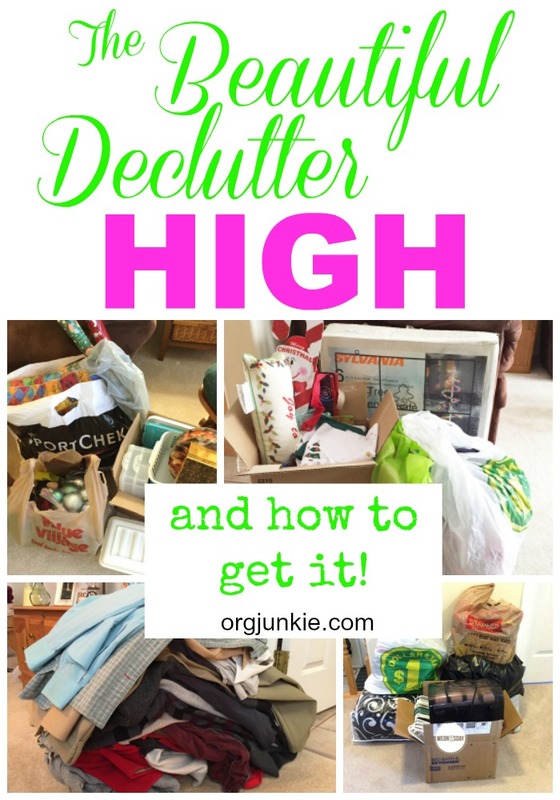 The Beautiful Declutter High & How to Get It! Hey there, many years ago I wrote this post sharing my love of the declutter high. I thought it would be fun to share it with you again (below) since this love of mine has not changed as you can clearly see from my 2016 purge picture compilation. You absolutely can’t be organized if you don’t first declutter and then continue to declutter on a regular basis. Unless of course you live in a bubble, on your own with no kids or furniture or clothes which wouldn’t only be lonely but a wee bit cold too 🙂 So let’s get to that post and hopefully you’ll find my purge enthusiasm a little bit contagious. I’m a constant purger. I absolutely love to throw things away. It makes me feel great and light and free…whoot! Unfortunately, too many people hold on to stuff so tight that they never get to feel this declutter high that comes from letting it go. If you haven’t felt it in awhile, you really must. It’s simply the best!! 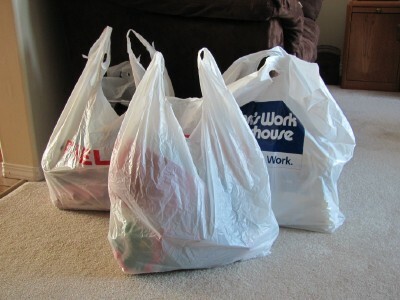 Since January I’ve already made two separate trips to the thrift store to drop off stuff. The second pile you see above happened at about 8:00 pm one night while I was playing hockey with the kids in the basement. All of a sudden, as we were dodging this and that on the floor, the room started to feel smaller and smaller. How hadn’t I noticed it before now? That was it, game over, mommas got to organize! The kids just roll their eyes, they know the drill. Anyway it became very clear to me right away that we had quite a few toys down there the kids had outgrown. My baby (6) isn’t a baby anymore. Out, out, out. The toys that is, not my “baby”. 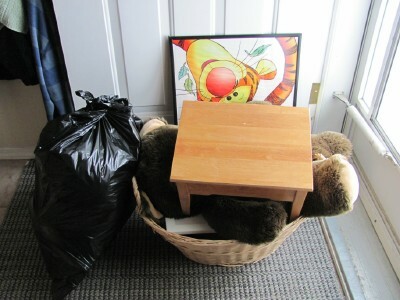 So an hour later we had collected some things for the thrift store (above), a big bag for the garbage and my hubbie took out to the garage a huge play table that I will sell. Oh how great it feels! What a sweet and glorious high! Seriously you’ve got to try it for yourself, just don’t take my word for it. Here’s what you do. Grab some garbage bags and fill them. End of story. Okay, okay I know it’s not that easy for some. But it could be that easy if and when you just decide that enough is enough already. If you have more stuff than space, you purge till it fits. As you are working, don’t let yourself get distracted in other areas of the house…remember focus on the task at hand. 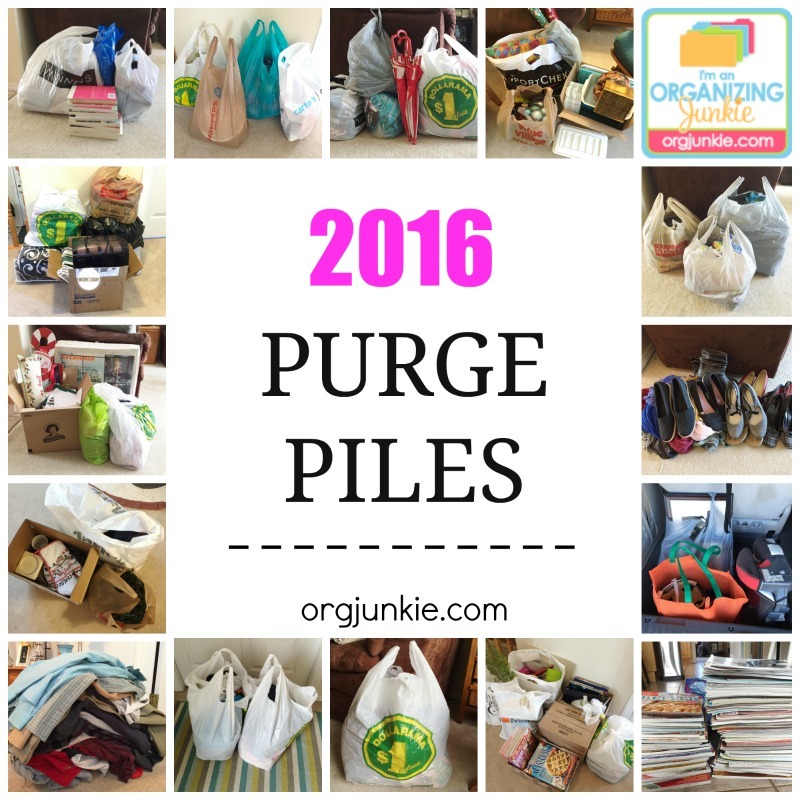 If you’ve got a lot of stuff to clear out then print off my purge labels and make an area for each category. Then it’s just a matter of starting. Initially you want to do a quick purge and not be held up hemming and hawing about any one thing. Put it to the side. Keep going and go back to that item later if you have to. You’ll see that as you keep moving, this purging thing gets easier. You’ll slowly start to get a small taste of the high and you’ll yearn for more. Go, go, go! Before you know it, you’ll be done. You’ll look around and think to yourself. Gosh this gal Org Junkie really knows what she’s talking about! 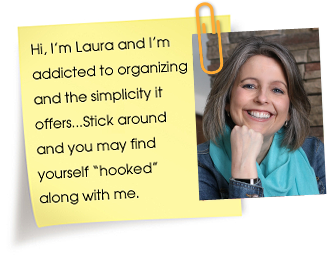 Well maybe you won’t say those exact words but you will be buzzing from your organizational high. That’s when I say to you. Welcome to my world friend, welcome to my world!!! PS: If you don’t already have one, make sure you set up a donation station in your home so you can really be a declutter rockstar! 8 Responses to The Beautiful Declutter High & How to Get It! Like your post on decluttering. I finally decided to make time and begin. 3 weeks later, I can already see a difference. I purged my Christmas decor as I was putting it away, though I love Christmas and have quite a few nice things. We have “housed” household items from my mom, my mom-in-law and a few things from my grandmother! I have a large walk-in storage closet in the center of my home, with shelving on 3 sides. Shelf by shelf. Today I packed 3 boxes. I’m looking at what I have done and not what I have left! Six boxes of sewing patterns (in those I was definitely a hoarder!) Went from 3 large mesh Elfa drawers to one! I’ve got the itch! Oh my goodness, way to go! Your comment made me so happy especially when you said “I’m looking at what I’ve done and not what I have left!”. Yes, this! So good. Keep it up! When I saw the title of this post, I absolutely had to read it! Hahaha, yay this makes me so happy!!! I LOVE that feeling when stuff leaves my home 🙂 I keep track of my decluttering piles too and it’s really neat to see how much it adds up over the course of a year. I always tell people that every little bit helps but it’s really neat to see the cumulative affect! Yay so glad your comment came through! Gwen this is so so great to hear!!! Keep riding that declutter high to motivate you to continue. Way to go girl! !